Information is provided by Rudy Horst of the Oberlin Congregational Church in Steilacoom. 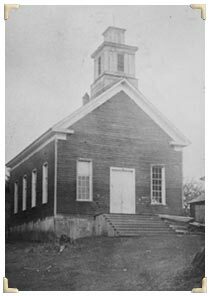 Since 1883, the Oberlin Congregational Church has served as Steilacoom's Protestant Church. The church was established and incorporated with eight charter members, including Arthur Burnell who served as the first minister. The vacant Presbyterian Mission, purchased with the help of the American Home Mission board, served as the first building. Then the name "Oberlin" was chosen and the by-laws of the church at Oberlin, Ohio, were adopted with slight amendments. In 1902 the church membership voted to build a new church. The old church was torn down and its lumber used in the new building. It is reported that timbers from the old Methodist Episcopal Church built in 1854 were also used. The two-story frame building, complete with steeple, was dedicated on June 2 and 3, 1893 with members of the First Congregational Church in Tacoma riding the electric streetcar to Steilacoom to join in the festivities. For many years Oberlin Church shared its minister with the congregations of nearby Lakeview and Lake City. In 1915 the church asked the Home Missionary Society for a loan of $144.00 to buy Reverend Charles Gaffney a motorcycle for traveling between Steilacoom and the other churches he served. The Reverend Herbert West became the first full time minister, serving from 1926 to 1951. Through the lean years it was the Ladies Aid who kept the Oberlin Church operating. The various fund raisers, potlucks, bazaars, and other social events enabled the church to purchase property paint and paper the parsonage, pay the minister's salary and furnish the church. As the community and the church continued to grow during the 1950's, the decision was made in 1960 to build a new church at the corner of Rainier and Pacific Streets. The first phase was completed in 1961, the second in 1978 with the additions of a Fellowship Hall, Sunday school rooms, offices and kitchen. In April 1983, Oberlin Congregational Church celebrated its Centennial Year. During those 100 years, twenty-eight ministers served the congregation. Where once a small group of parishioners took turns maintaining and repairing the church building, now a paid staff of several people, carry out the church's business. Oberlin has a membership of nearly 300 and continues to reach out to the community and the surrounding area with its message of the gospel. As Steilacoom's oldest "pioneer" corporation, it joins Washington State in its sesquicentennial celebration.